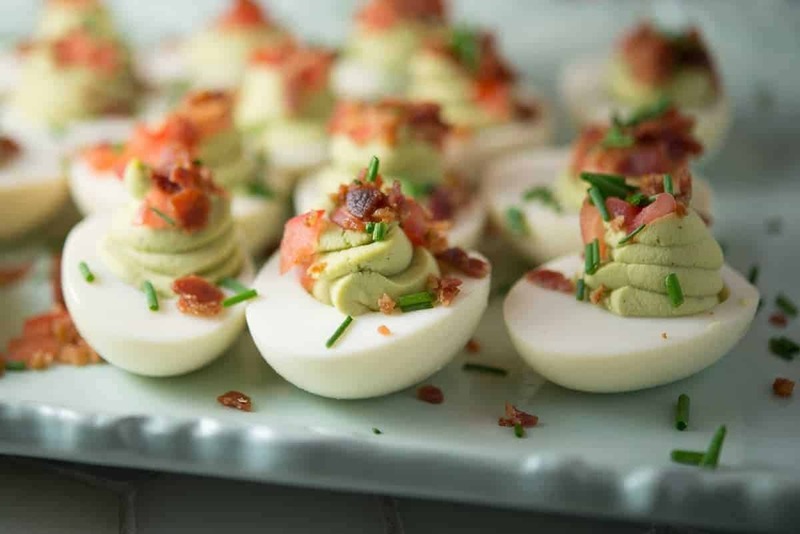 Up your nutrition game with these BTA (Bacon, Tomato, Avocado) deviled eggs. These Paleo gems are about to rock your holiday world! I don’t know about you, but deviled eggs are a requirement for Easter at our house. These gorgeous little gems are so good! And they’re completely at home on any holiday’s table! I love eggs prepared almost anyway – but there is something extra special about deviled eggs. They’re fancy! My grandmother’s original recipe is delicious. Growing up my mom made them every year for Easter and Christmas and sometimes even Thanksgiving. No matter how many she made, the plate was always empty at the end of the night. This year I wanted to make my own version of deviled eggs – one that’s been nutritionally optimized. These green deviled Easter eggs are easy, tasty and full of healthy fat. What more could you want? In this recipe, avocado serves as a substitute for the traditional mayo. The avocado provides a rich flavor and gives the eggs a gorgeous light green color. There’s a little bit of maple syrup and a hint of smoked paprika that gives these babies sweet and smoky notes which pairs magically with the crumbled bacon. Top the whole thing off with some finely diced tomatoes and chives, and you get a party in your mouth! Topped with crispy bacon and fresh tomatoes. I am going to tell you the answer to the most asked question about hard-boiled eggs. How to make sure you can easily peel hard-boiled eggs. PRO TIP: The secret to being able to peel hard-boiled eggs. Bring water to a boil before adding the eggs. Add eggs using a spoon to prevent splashing the hot water. Remove and cool, either under cold water or just let them sit until cool enough to peel. Barbecue Pork Skewers with Peach-Bourbon Barbecue Sauce. These paleo friendly deviled eggs are packed with nutritious fats from avocado instead of traditional mayonnaise. 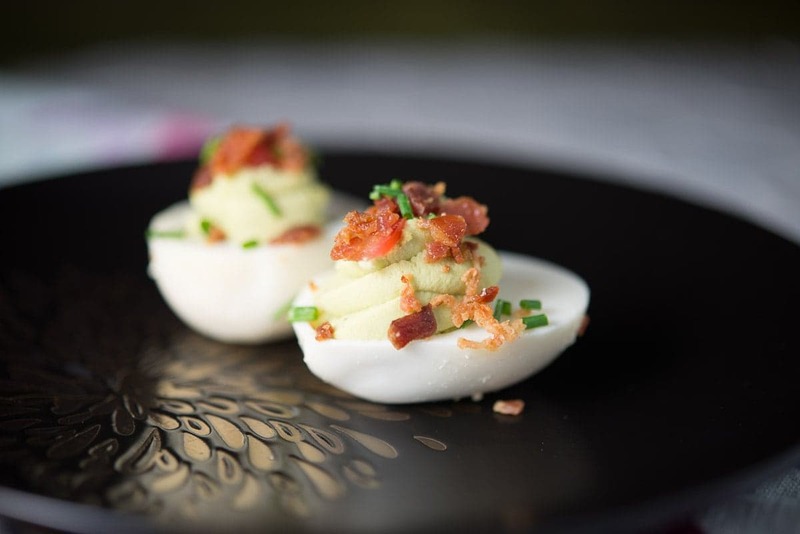 Smoky sweet flavor with salty crumbled bacon makes for a super kicked up version of traditional deviled eggs. Hard boil eggs 1 dozen eggs. While eggs are boiling, crumble the bacon and chop the toppings. Let eggs cool – place in ice water to chill quickly. Peel and then slice eggs in half. Add yolks to a food processor bowl. Place the mixture in a sandwich bag, and cut the tip off of one end so that you have a small opening. Pipe the filling into the egg white halves. Top with bacon, tomatoes, and chives. Sweet and tangy deviled eggs. This is a holiday tradition in our family. Hard boil 1 dozen eggs. Cool, peel and slice in half. Reserve the yolks in a medium bowl. Smash yolks, add the remaining ingredients. My grandma always just used a fork to do this. Mix until smooth. Use a spoon to fill the eggs with filling. Optional: Sprinkle with paprika if desired. Enjoy! Try to eat just one!